CSC has been a Fortune 500 company since 1995, ranked 185 in the 2014 rankings. The company also figures in the Forbes Global 2000 list. 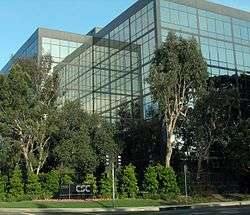 CSC was founded in April 1959 in Los Angeles, California, by Roy Nutt and Fletcher Jones. CSC initially provided programming tools such as compiler and assembling software. In the 1960s, CSC provided software writing services to major computer manufacturers like IBM and Honeywell and secured their first contracts for the U.S. public sector with NASA (among others). In May 2015, CSC announced plans to split the public sector business from its commercial and international business. In August, it was announced that CSC's Government Service business would merge with SRA International to form a new company -- CSRA—at the end of November 2015. In November 2015, CSC agreed to acquire the shares of UXC, an IT services company based in Australia in a deal valued at AUD427.6 million (US$309 million). CSC employs about 56,000 employees (as of February 2016) in 60 countries and ranks among the leading IT service providers in the world. Geographically, CSC has major operations throughout North America, Europe, Asia, and Australia. North American Public Sector (NPS): Since 1961, CSC has been one of the major IT service providers for the U.S. federal government. CSC provides services to the United States Department of Defense, law enforcement and intelligence agencies (FBI, CIA, Homeland Security), aeronatics and aerospace agencies (NASA). In 2012, U.S. federal contracts accounted for 36% of CSC total revenue. The company has made several acquisitions, including DynCorp in 2003 and Covansys Corporation in 2007. In September 2012, CSC was ranked 8th in Software Magazine’s Software 500 ranking of the world’s largest software and service providers. In December 2011, the non-partisan organization Public Campaign criticized CSC for spending $4.39 million on lobbying and not paying any taxes during 2008–10, instead getting $305 million in tax rebates, despite making a profit of $1.67 billion. In February 2011, the U.S. Securities and Exchange Commission (SEC) launched a fraud investigation into CSC’s accounting practices in Denmark and Australian business. CSC's CFO Mike Mancuso confirmed that accounting errors and intentional misconduct by certain personnel in Australia prompted SEC regulators to turn their gaze to Australia. Mancuso also stated that the alleged misconduct includes $19 million in both intentional accounting irregularities and unintentional accounting errors. Millions of visas allowing foreigners to enter Britain are being issued by CSC rather than by British diplomats. CSC was one of the contractors hired by the Internal Revenue Service to modernize its tax-filing system. They told the IRS it would meet a January 2006 deadline, but failed to do so, leaving the IRS with no system capable of detecting fraud. Its failure to meet the delivery deadline for developing an automated refund fraud detection system cost the IRS between $200 million and $300 million. ↑ "Management and Board of Directors". Computer Sciences Corporation. Retrieved 2 July 2015. 1 2 3 4 5 6 "CSC company profile". Company. ↑ "Company Profile". Computer Sciences Corporation. Retrieved 2016-02-25. 1 2 3 "Computer Sciences Corporation, Form 10-K, Annual Report, Filing Date May 15, 2013". BusinessWeek.com. Retrieved Dec 27, 2013. ↑ "Affiliated Computer Services, Form 8-K, Current Report, Filing Date Sep 29, 2009" (PDF). secdatabase.com. Retrieved Mar 29, 2013. ↑ "Xerox In $6.4 Billion ACS Buy: Xerox will pay cash and stock to acquire IT and business process outsourcer Affiliated Computer Services". Information Week. September 28, 2009. Retrieved June 1, 2010. ↑ "Fortune 500". Fortune. Retrieved 2 July 2015. ↑ "The World's Biggest Public Companies". Forbes. Retrieved 2 July 2015. ↑ "CSC Announces Merger with Enterprise Services Segment of Hewlett Packard Enterprise to Create Global IT Services Leader". BusinessWire. Retrieved 24 May 2016. ↑ "Our History". CSC web site. Retrieved June 1, 2010. 1 2 "CSC, History". fundinguniverse.com. ↑ "History in the Computing Curriculum" (PDF). Retrieved November 21, 2014. ↑ "Computer Sciences Corporation, Form 10-Q, Quarterly Report, Filing Date Feb 6, 2008". secdatabase.com. Retrieved Mar 29, 2013. ↑ "Computer Sciences Corporation, Form 8-K, Current Report, Filing Date Mar 31, 2008". secdatabase.com. Retrieved Mar 29, 2013. ↑ "FORTUNE 500: Companies by year C". CNN. Retrieved March 28, 2011. ↑ "Fortune 500 - Fortune". Fortune. Retrieved 2 July 2015. ↑ "Exclusive: Computer Sciences prepares to break itself up - sources". Reuters. 14 May 2015. Retrieved 21 May 2015. ↑ "CSC to Combine Government Services Unit with SRA Upon Separation from CSC; Combination will Create Leading Pure-Play Government I.T. Business in the U.S.". CSC. Retrieved October 2, 2015. ↑ "CSC and HCL Form Joint Venture to Deliver Digital Software and Services to Global Banking Clients". BusinessWire. Retrieved 23 July 2015. ↑ "Computer Sciences (CSC) Completes Fixnetix Acquisition". NASDAQ.com. Retrieved 2016-02-25. ↑ "CSC Finalizes Fruition Partners Acquisition". Computer Sciences Corporation. Retrieved 2016-02-25. ↑ "CSC Confirms Agreement to Acquire Australia's UXC Limited". Computer Sciences Corporation. Retrieved 2016-02-25. ↑ "Computer Sciences Corporation to buy Xchanging in £480m deal". www.cityam.com. Retrieved 2015-12-09. ↑ "CSC moving headquarters to Tysons Corner". WTOP. Retrieved 2016-02-25. ↑ Software Company | url=http://www.niveosys.com | Magic Quadrant for End-User Outsourcing Services, North America, 26 August 2014 | publisher=Gartner, Inc.
↑ "The Top Companies in the IT Services Industry (2009)". Retrieved November 25, 2014. ↑ "Top 10 IT Service Providing Companies". siliconindia.com. Retrieved November 25, 2014. 1 2 "Supplier profile: CSC". Computer Weekly. ↑ "CSC Wins $59 Million Task Order From FBI to Provide Call Center". Bloomberg. ↑ "Computer weekly Supplier Profile : CSC" (PDF). CSC’s outsourcing journey has brought it full circle. p. 3. ↑ "Computer Sciences Corporation, Form 8-K, Current Report, Filing Date Dec 13, 2002". secdatabase.com. Retrieved Mar 29, 2013. ↑ "CSC Named to Software Magazine's 30th Annual Software 500". Computer Sciences Corporation. Retrieved 2 July 2015. ↑ Portero, Ashley. "30 Major U.S. Corporations Paid More to Lobby Congress Than Income Taxes, 2008-2010". International Business Times. Archived from the original on December 26, 2011. Retrieved 26 December 2011. ↑ Nebojsa Despotovic (13 November 2011). "CSC Accounting Fraud Extends to Australia - BizCloud® Network". BizCloud® Network. Retrieved 2 July 2015. ↑ Rupert Neate. "Lloyds owns stake in US firm accused over CIA torture flights". the Guardian. Retrieved 2 July 2015. ↑ "Revealed: US firm issues British visas... and MPs were not told". Mail Online. Retrieved 2 July 2015. ↑ "Obamacare Contractors Plagued by Previous Failures, Fines, Fraud". Newsmax. Retrieved 2 July 2015.